N Scale kit features laser cut acrylic parts with engraved stonework. This kit is identical to our HO scale kit. 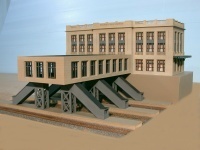 The station and concourse are sold together in the N scale version. The stairs raise the concourse and station to about 2 inches above track level on our N scale model.